While a visit to see the Northern Lights is an adventure in and of itself, there are a multitude of activities you should consider adding to your itinerary. One such activity that’s open year-round is the Aurora Ice Museum! Whether you’re fascinated with the art of ice sculpting or need a family-friendly activity for your trip, make sure you don’t miss a visit to this museum. Here are 5 facts you should know before visiting the Aurora Ice Sculpture Museum. Created by 16-time world champion Steve Brice and his wife, 7-time world champion, Heather Brice, you’ll be amazed by the beauty of these sculptures. Get a preview of the sculptures here. Heather and Brice have been crafting art together since 1999. While their year-round ice workshop is at the Aurora Ice Museum at the Chena Hot Springs Resort, they also work at events both small and large. Learn more about their art at the Brice’s website. If you’re interested in getting up close and personal with ice sculpting, the museum offers a 2-hour ice carving class, with a maximum class size of 3 people. One feature of the museum is a two-story observation tower with a circular staircase. From there you can see other sculptures such as, life size jousters on horseback, a polar bear bedroom, a Christmas tree bedroom, a kid’s 2 story fort bedroom and a Northern Lights room with an ice outhouse made exclusively with Alaska Diamond or Alaska Marble ice. After touring the museum, enjoy our specialty beverage, an Appletini, in an iced carved martini glass. If you’re worried about being cold, you can enjoy your drink on a caribou fur covered stool and take in the view or warm your hands by the ice fireplace. Before you visit, prepare for the atmosphere! The museum stays at a cool 25° Fahrenheit or -7° Celsius at all times. In order to keep it cool in the heat of summer, they have a patented absorption chiller, the first of its kind in the world used for this purpose. While you can certainly bring your own warm coat, the museum also offers parkas free of charge during the tour. While the cost for a tour in the ice sculpture museum is typically $15 per person, it is included with the Northern Lights trip when you book with Gondwana Ecotours. 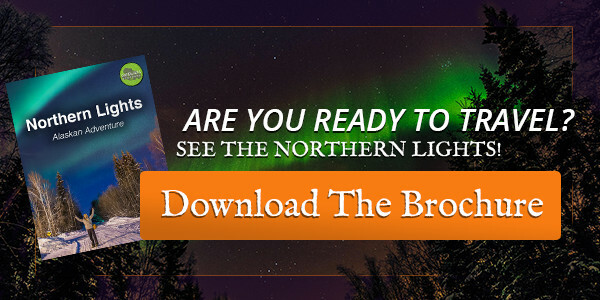 Learn more about our Northern Lights Adventure or click below for the full brochure. You can also catch a glimpse of the experience in this brief video. Our ecotour offers everything you could want when you visit Alaska – including expert Alaska guides, entry to Chena Hot Springs, a curling lesson from local players, a dog-sledding excursion, and so much more. Since sustainability is important to us, we donate a portion of proceeds from Northern Lights Alaskan Adventure trips to the non-profit, Northern Alaska Environmental Center.